People identify you with the name. It gives you a unique identity in crowd, society and even online. Is n’t it? In WordPress, your articles will appear under the author tag of yours. Author name is the combination of your first and last names or username or nickname. Sign into your WordPress site first. Open your profile from the Users menu in the left pane. 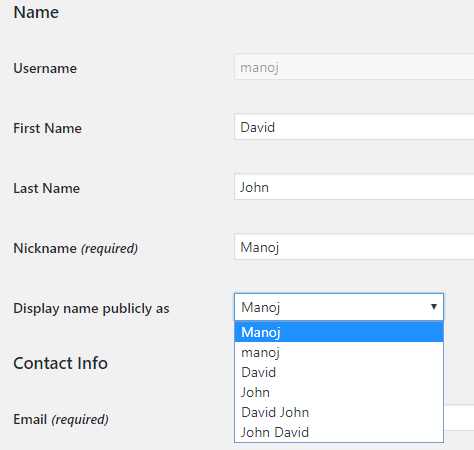 Under Name option, you will see various fields to configure your author name. Username cannot be changed. But first, last and nicknames are customizable. You can either enter name parts or leave it as blank. If entered, you will get combinations of it in the drop-down box of the Display name. It also allows you to choose username or Nickname to represent you in public. Which is the best method to change your display name? Change your Nickname. It’s a mandatory field in every user profile. You can quickly change your display name by making changes in the nickname.